Rihanna made her New York Fashion Week debut as she presented the first full collection for Fenty x Puma, also known as Puma by Rihanna. This is not the entertainer’s first venture into the fashion world as she has previously worked with Armani Jeans and River Island on limited collections and she has been the face of numerous fashion campaigns. But Rihanna’s role at Puma is so much more important since she is not only a brand ambassador but also the Creative Director for the women’s training division. It’s no wonder why she was selected for the job as she is one of music’s biggest stars who is also recognised for her amazing sense of style on and off the red carpet. The Barbadian superstar has worked closely with the Fenty x Puma team over the last year to create this collection. In that year she has also significantly raised the athletic brand’s profile and introduced it to her millions of fans around the world, many of whom will admit that they never gave Puma a chance before she sealed the deal. Those same fans are the ones who clamoured for the release of the Puma by Rihanna Creeper, a re-imagining of the brand’s signature Suede Classic sneakers based on her own personal street style. Both releases of the Creeper sold out quickly online and in store and has left fashionistas worldwide begging for more. With so much hype surrounding this first collection, there must have been a lot of pressure but she certainly didn’t disappoint. This is Puma like you’ve never seen it before. Once we got a look backstage at the models, it was clear what this collection would be all about. 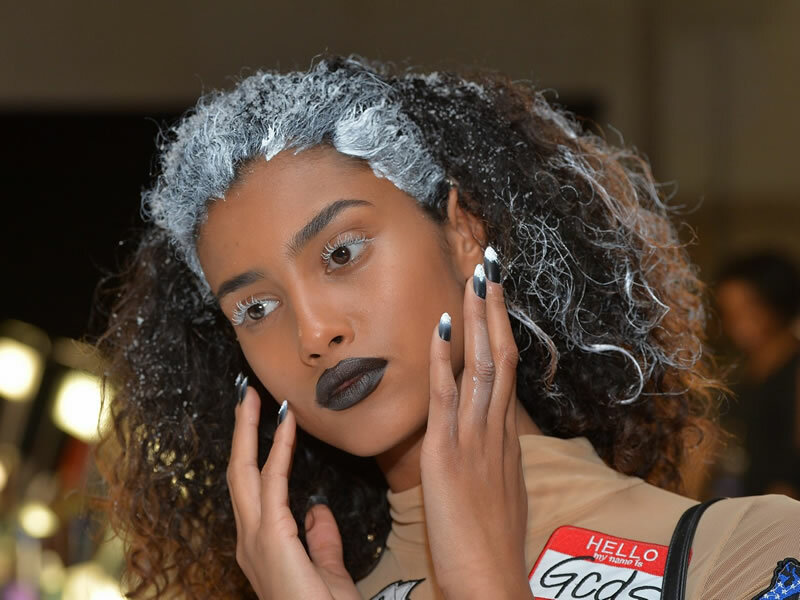 Dark lips, white roots, and black nails tipped in white goo gave us all the hints we needed. A black carpet welcomed celebrity guests such as Anna Wintour, Naomi Campbell and Jeremy Scott while a mirrored, tree-lined, slate runway was readied for the models’ appearance. Badgalriri herself turned up in a chin-length black bob, a black lace dress and platform boots. It was all “Ghetto Goth” as she likes to call it. Her inspiration, as she told Vogue, was the Addams Family. 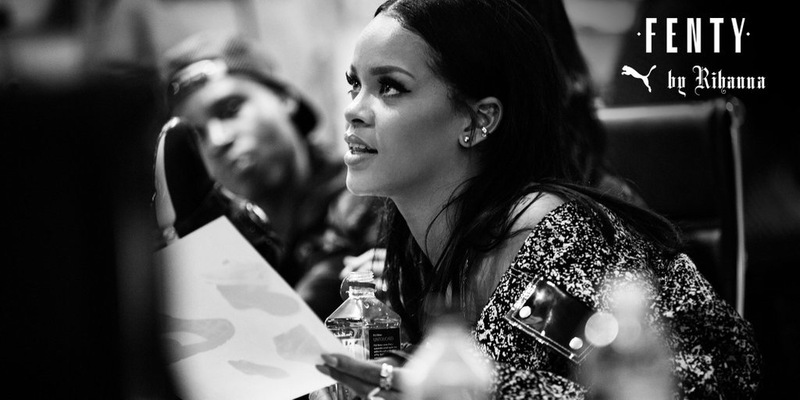 This streetwear collection greatly reflects Rihanna’s personal style. She even dressed the models in rosary body chains, rings and cross chokers from Lynn Ban, her favourite jewellery designer. Models rocked oversized coats, hoodies with extra-long sleeves, sheer tops, super baggy pants and even an off-the-shoulder bomber that are all reminscent of the singer’s favourite brands. Those highly-coveted Creepers were also present, now with an even higher platform. The inclusion of Japanese kanji and katakana seemed like an odd choice at first but she did take an eye-opening trip to Tokyo last year and there isn’t much cooler than Tokyo street style. Also, the lace-up detail throughout adds a nice athletic touch to a collection that doesn’t scream athleisure, which was probably the point of it all. Below is every look from the collection so click through and enjoy. The collection will be available later this year from Puma’s websites and physical stores. But you can also expect to find the collection at Footlocker, Opening Ceremony and Nordstrom.